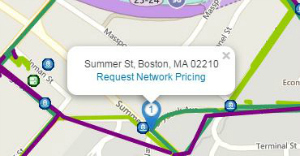 Are you searching for an online fiber map? The FiberLocator online application gives you on-demand access to telecom network and colocation information: fiber optic network maps and even specific data center and on-net building information. Whether you’re in network planning, procurement or a related function such as commercial real estate or business intelligence — researching telecom and colocation information becomes much faster, simpler, more accurate and more complete with FiberLocator Online. Built by network planners and procurement specialists, FiberLocator greatly streamlines your workflow and saves considerable time and resources in the search for fiber optic maps, lit buildings and data centers. Subscriptions to FiberLocator are available starting at $3,800/year on a 12-month minimum term. From the moment you login, you can search addresses, cities, states, regions and even landmarks in the simple search box. If you’d rather just start searching the map directly by clicking and using the zoom tools, you can do that too. 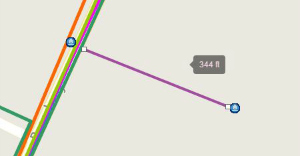 When you use the search bar, FiberLocator will place a pushpin to mark the location you’ve specified, and the pushpin will remain in your session until you decide to clear your markers. See metro fiber routes, long-haul networks, data centers, lit buildings and more down to the street level. 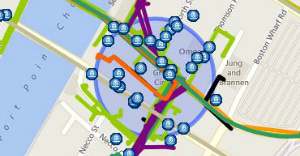 You can zoom in and out of any map view in FiberLocator to see whatever detail level you need. Zoom in to see individual on-net or near-net buildings or zoom out to see long-haul routes between metro areas. You choose what data to include onscreen and the zoom level that shows your areas of interest. Toggle different data layers on or off to get that perfect view. Choose from long-haul fiber networks, metro networks, lit buildings, data centers and more. You can even control the layer display down to a specific carrier or set of carriers. That means you include or exclude any provider from your search with just a click. 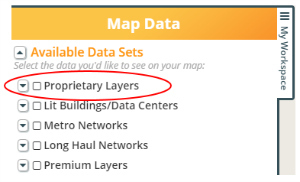 One of the newest features we’ve added to FiberLocator is the ability to upload your own data into the database under the “Proprietary Layers” section. You can upload any of your own fiber research into the tool including sold circuits, shadow conduit, cell towers, lit building information, and more. This information remains private and viewable only to your account. Save time by only using one system to house all of your network and telecommunications infrastructure information. FiberLocator subscribers can request and evaluate pricing options straight from the FiberLocator interface. 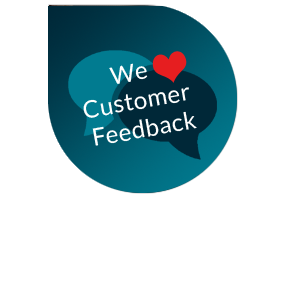 By requesting a quote through FiberLocator, the network selection process gets even easier: an experienced consultant from one of our Partner companies. FiberLocator will work with carriers to get multiple quotes with the best pricing options. Because of our relationships with providers and volume of orders, they can often secure pricing below the listed rates of many carriers. 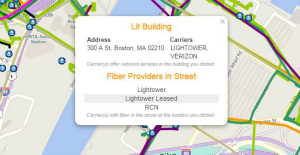 One of the most powerful functions of FiberLocator is the ability to see which carriers light a certain building or data center and which may have fiber in the street nearby. FiberLocator also reports on PoPs and carrier hotels. 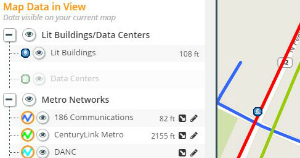 Just click on a building or data center icon and immediately see who has fiber in that location. Often times, getting data surrounding a single reference point is helpful when selecting carriers that are near-net but not on-net to a certain building or location. FiberLocator can find all networks, buildings, landmarks and more within a specified radius overlay on the existing map view. Are you connecting to a network? Need to estimate your shortest feasible path to an interconnect point? FiberLocator measures fiber distances and spans between points and networks. Click along a route, with as many directions changes as you’d like, and get your distance in feet or miles. Take FiberLocator data with you quickly and easily with multiple output options. 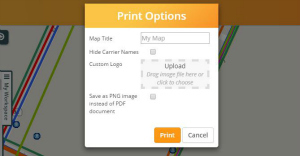 You can print maps including the carrier legend or save your sessions for later analysis in FiberLocator. You can even upload your own logo or graphic header to the map to insert in a report or power point presentation. Having trouble sorting through carriers in a saturated metro area? No problem. 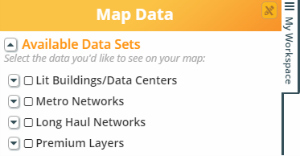 Open up your “Map Data in View” to automatically filter carriers and providers to only those contained in your current map view. 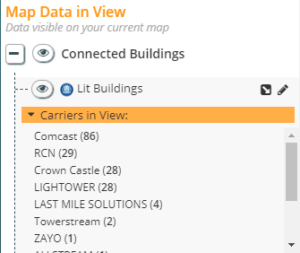 One of our newest features in FiberLocator is the ability to get a lit building count for each carrier that is currently appearing on your screen. Simply click the orange “Carriers in View” bar and it will expand to show you the carrier name and the number of lit buildings in parenthesis. Zoom in and out to see the numbers update.